7 May 2018, 10 a.m.
7 May 2018, 4 p.m. The annual Community Fayre and celebration of life in Fratton held in the Church and grounds. 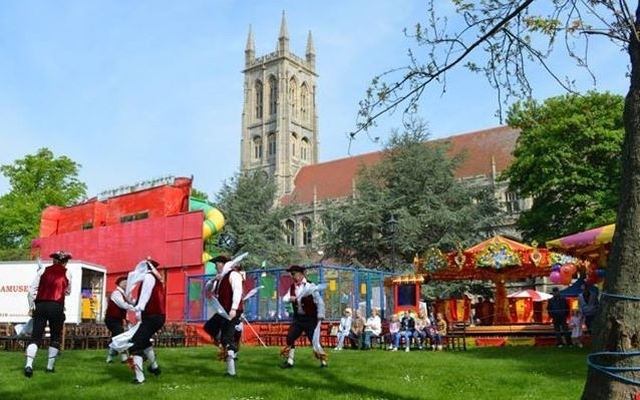 Each year around 10,000 visitors enjoy this event with its variety of attractions – Real Ale Tent; Arena displays; Bouncy Castle; Bands; Funfair rides; and much more … including 100 + stalls. If you would like to book a stall or a display space please email mayfayre@portseaparish.co.uk. Alternatively you can ring the St Mary’s office and leave a message and someone will get back in touch with you within 48hrs. 023 9281 4444. Rail: Fratton station (0.6 miles). Bus 14, 18, 21 (3, 7, 23 stop nearby). Wheelchair access to church. Disabled badge holders parking.